The search for efficient and powerful photoanode materials remains one of the toughest challenges in photoelectrochemical (PEC) water splitting because the oxygen evolution reaction on the photoanode is a rate-limiting process. On the other hand, the semiconductor/liquid interface is a key factor governing the water splitting efficiency due to its influence on charge separation and collection. Herein, we synthesized vertically aligned WO3 nanosheet array (NS) films on fluorine-doped tin oxide (FTO), and followed by electroreduction for tuning the surface structure of WO3 NSs. A disordered layer is formed on the surface of WO3 NSs by controlling the external bias voltage and reduction time of electroreduction, and its thickness of the disordered layer varies with reduction time. The optimal WO3 NSs with a 1.2 nm disorder layer thickness exhibit a remarkable photocurrent density of 1.07 mA cm−2 at 1.23 V vs reversible hydrogen electrode (RHE) under AM 1.5G illumination, which is 1.43 times of pristine WO3 NSs. 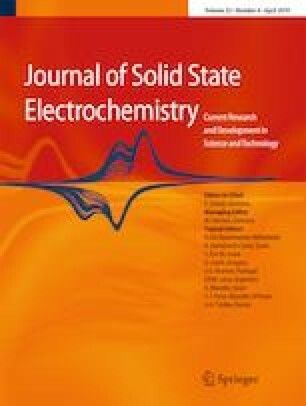 The results indicate that the electroreduction voltage and reduction time exert great influence on the formation of the surface disordered layer, and the optimized reduction conditions can enhance charge transfer and charge separation efficiency, substantially improving the PEC performance of WO3 photoanode. Liu-Dan Zhao and Qian Zhang contributed equally to this work. The online version of this article ( https://doi.org/10.1007/s10008-019-04257-x) contains supplementary material, which is available to authorized users. This work was supported by the National Natural Science Foundation of China (Nos. 21471133 and 21671176) and National Training Program of Innovation and Entrepreneurship for Undergraduates (No. 201810459001).